Crist's support was crucial for McCain in the state's Republican presidential primary last year. WASHINGTON (CNN) - Florida Gov. Charlie Crist endorsed John McCain the weekend before McCain won the state's pivotal Republican primary last year, a victory that may very well have sealed the GOP nomination for the Arizona senator. On Wednesday, John McCain returned the favor. "Today I am pleased to endorse Charlie Crist for the United States Senate," McCain said in a statement released by Crist's campaign. "Now more than ever, we need leaders who are committed to lower taxes, limiting government spending, and fighting for the people are needed in Washington," he said. McCain is the latest top Republican to endorse Crist's Senate bid as party leaders in Washington look to avoid a difficult primary battle in Florida. Crist is facing an intra-party challenge from former state House speaker Marco Rubio, but according to a new Mason-Dixon poll, Crist leads Rubio by 35 points. Tallahassee-The Charlie Crist for Senate Campaign today announced the endorsement of United States Senator John McCain. "Today I am pleased to endorse Charlie Crist for the United States Senate," said Senator McCain. "Now more than ever, we need leaders who are committed to lower taxes, limiting government spending, and fighting for the people are needed in Washington." "As Governor, Charlie Crist has demonstrated his commitment to these fiscally conservative principles by delivering the largest tax cut in Florida history, reducing government spending, and focusing on the issues that are important to Floridians," continued Senator McCain. "I was proud to have had Charlie's support in my campaign, and I am proud to support him in his campaign. I am proud to call him my friend and look forward to calling him my colleague." I wonder what Limbaugh has to say about this! oh man! Crist you just got the kiss of death! Well McCains, endoresment will mean the Kiss Of Death for this Rupub.. When McCain opens his mouth to spout "lower taxes, smaller government . . .blah, blah, blah," it just goes to show that the GOP continue not to GET IT! Crist, as a Senator, will be lost in the sheep herd, and if he continues to spout the tired Republican rhetoric, his run may be short and sweet. Gov Crist will be a fine senator. These guys (republicans) are in trouble. If Crist loses the primary to the moonbat from the ultra right, the Democrat will will that senate seat easily. THAT is why the establishment is lining up behind him. It is so much fun being a Democrat right now, I am giddy ! I call you out as a poser, troll. You were NEVER a Democrat, or you would realize the policies being put in place are SPECIFICALLY for the middle class. Did McCain do any vetting on Crist, I doubt it. McCain's cred went out the window when he chose Sugarskirt. 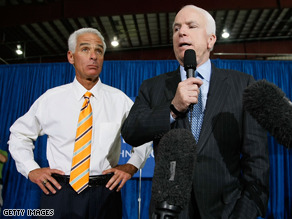 Governor Crist look really thrilled to have McCain's endorsement. Talk about a picture saying a thousand words. Crist is boarding MaCain loosing wagon. Good luck! Republicians still blind leading the blind. Crist you have been elimated already by McClain. These Republicians disagree with anything as we need to pull together. You guys already have made other alies loose our trust etc. When the hard right calls one of their own a RINO, to this independent it means I need to take a second look at him!! I live in Arizona and I am a Republican,but I haven't and never will vote for JUAN McCAIN. Mr.Crist had better step away from Juan. Goodbye, Charlie. McCain endorsement = kiss of death. Can we all just admit that Crist is a homosexual and that our party rejects homosexuals and their deviant behavior?